I love collaborating in symposia! 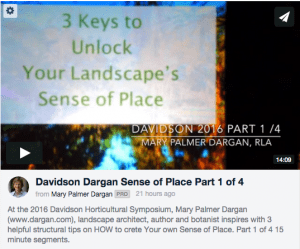 Davidson Horticultural Symposium has taken place for over 30 years bringing fantastic learning experiences to many a budding horticulturist, homeowner or landscape designer. Fergus Garrett, Great Dixter’s chief of horticulture and garden friend, presented many beautiful ideas of layering plants. When my time came to speak, it was well after lunch, so I “revved up the engine”! Enjoy my lectures on how to extract the very best from your property! Divided into 4 parts, each about 15 minutes, you can dip in and out of great take home material to improve your sense of place. I consider this to be my very best lecture…EVER! 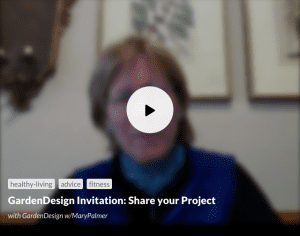 Garden design blab participate in videoconferencing at its best and feature your project! No matter what season in the calendar of life, improvements to home environment, body and soul are perennials at the top of my list. Action steps can be large or small… This year at Dovecote saw raised organic gardening beds, a greenhouse and new barn lecture studio. What is on your wish Garden design calendar to-do list this year? If you’ve been following my blogs, books or lectures, you know that I’m very accessible. 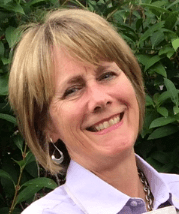 I want to facilitate your decision-making to transform your ho-hum home environment into the oasis of your dreams. 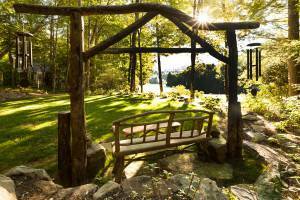 Have a landscape design question? Ask it! New technology, called blabbing, makes it possible to videoconference straight from your computer or iPad into my garden design salon. It’s free. You propose the topics and I will call in a stable of consultants to answer your questions! You’ll even have the opportunity to ask them a question virtually face-to-face. I think this is very cool and will begin with a series of garden talk salon blabs in the near future… Once I master the technology, that is! 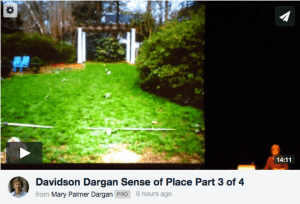 In structuring this blab-fest of garden design salon topics, I looked at a survey from the spring and so many of you wanted to know how to design special places on your landscape, and have it all work harmoniously – like holding hands with your garden environment. When I work with clients, The first thing we do is brainstorm the big picture with a long-range wish list of dreams and goals. This list ultimately merges with an aerial photograph or site plan showing your property so that it becomes site-specific. I’d love to interview several of you to learn your dreams and goals. Learn how to creatively walk together through the design process. Think of yourself as a test case. 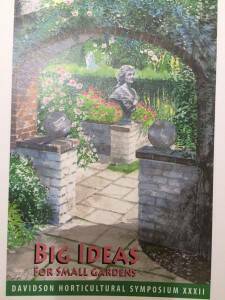 You can share your dilemmas and epiphanies in the garden design blabs. No doubt it will be improvisational to introduce you, let’s say, four to eight landscape designing homeowners and watch as your projects unfold. .Do you have a balcony garden or a tiny town home? .Are you a family needing play space or organic gardens? 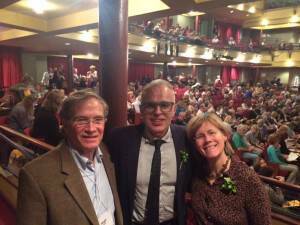 .Are you an elder downsizing and want to make the most of your space? You will have a buddy to design with! Teams of two will be supportive of each other. So you can brainstorm about your individual projects. 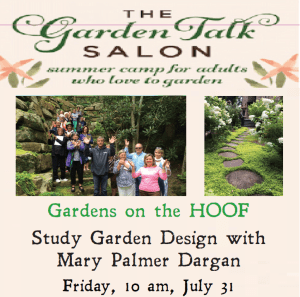 A Facebook group for our garden design salon blab will share photographs of before and after… and during! 35 years I’ve enjoyed collaborating with clients and have this unique opportunity to share in a virtual fashion with a special group of you. This is free and requires that you commit to seeing the project through, so you may want to make it a small project! Fit it within your budget and action plan to have completed by March 2016. What do I need to qualify for this unique garden design blab? 3) A sketch of what you want to do will be created during our blab sessions, so be able to do simple mapping and I will help you execute this sketch with simple guidelines. You do not need to be an artist! Or a doctor or engineer or horticulturist… Just a homeowner with positive forward motion and a commitment to improvement in their home environment. 4) A computer and a microphone and an Internet connection. We will test your system to ensure you have a stable seat in our blab. 5) A collaborative sense of humor and ability to work with the team. 6) willingness to share your successes and failures and the ability to take pictures of this and upload them to our Facebook page. 7) The ability to use a Facebook page to download documents such as the schedule of blabs and do your homework assignments. 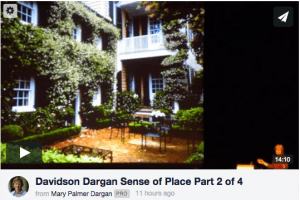 Yup, I’m very excited about new technology and the ability to share landscape design from your home environment to the world of our garden designblab. 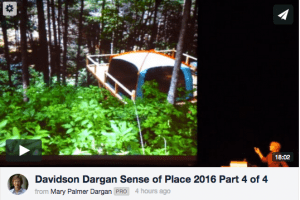 Your blab garden does not need to be a showplace, just a real place! Once it’s finished, it will touch move and inspire others to take action to create the home environment of their dreams. Thank you Dovecote friends. 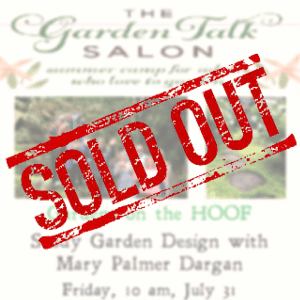 This Friday’s Garden Talk Salon (the last one for July) is already sold out! Contact Mary Palmer Dargan to be put on the waiting list at 828-743-0307or [email protected]. Checks for the event will be accepted at Dovecote. We don’t like turning away enthusiastic gardening fans. That’s why it is really important to sign up as quickly as possible for events. Browse our events by clicking here and make sure to sign up ASAP.